As the California wildfires continue to rage across the state, more than 60 IAFF members have already had their homes destroyed, while hundreds more who have been evacuated — many who continue to work on the fire lines — don’t yet know the status of their homes. To date, more than $163,000 in direct financial assistance has been distributed to IAFF members and their families, with more requests for disaster relief anticipated as the IAFF works to determine the status of members’ homes currently listed as unknown. 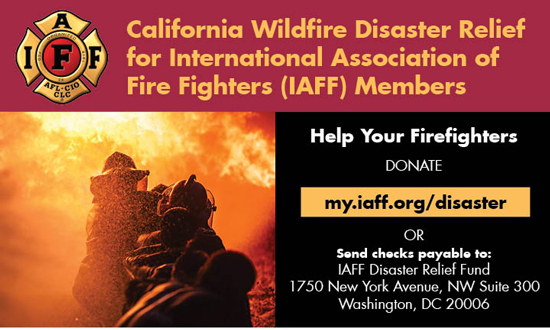 The best way you can help the brave firefighters fighting to help others is to donate to the IAFF Disaster Relief Fund, which provides assistance to IAFF members and their families in their times of need. Donate today with a tax-deductible contribution online.